We are excited to share reports on the 68th JASC written by the newly elected American Chair and Vice Chair of the 69th JASC! 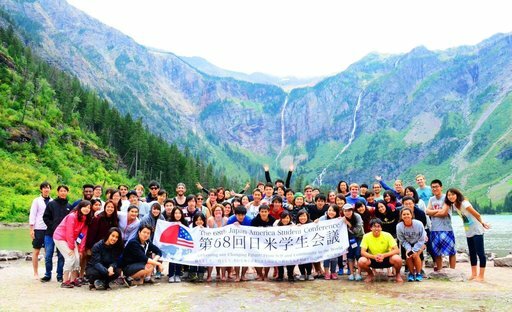 Yuta Baba, Chairman of the 69th JASC American Executive Committee, reflects on how JASC helped him see and experience new aspects of the United States, the U.S.-Japan relationship, and himself. His report focuses on Boston and San Francisco, the opening and closing sites of the 68th JASC. 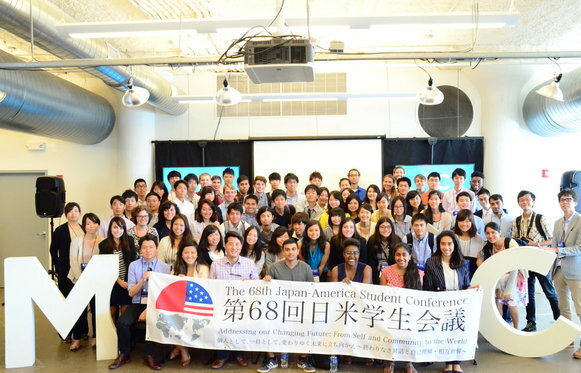 I was both excited and nervous when I landed in Boston, the first site of the 68th JASC. However, my worries quickly wore off as I began meeting my fellow delegates. Although we had just met, everyone was open to sharing their personal opinions and listening to others. One of the most memorable moments in Boston was the visit to MassChallenge, a global startup accelerator that supports social entrepreneurship. Meeting social entrepreneurs of our age not only inspired us, but also taught us to not fear rejection. These passionate individuals shared their major takeaways, one of which is to always trust yourself and keep moving forward. This is something that applies not only to social entrepreneurship but to our everyday lives. The visit to MassChallenge also taught me the many facets of Boston. Prior to JASC, I had viewed Boston as a historical city, and was therefore surprised to learn that the city is now hub for entrepreneurship. Seeing this new aspect of Boston, I became very excited to explore other cities as a JASCer. The final city that we visited in the 68th JASC was San Francisco. The City of San Francisco was formed in a very different way compared to the other cities we visited, such as Washington, D.C. and Boston. While the houses and buildings in Boston were older, more traditional in style and had more spaces between each other, those in San Francisco were relatively new and were all packed together. Visiting four cities, I was able to see the diversity within the U.S., not only in terms of the themes we explored but also in terms of the city planning that reflected the characteristics of each city. On the first day, we climbed up steep slopes to visit the Residence of the Consul General of Japan in San Francisco. All the walking was totally worth it, as we saw the beautiful view of the ocean and the Golden Gate Bridge from his Residence. I would like to express my sincerest appreciation to the San Francisco Consul General for opening his Residence to us. 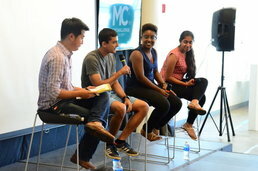 The next day, JASC held a series of academic events. The Diversity Symposium on Women’s Issues and LGBTQ was particularly inspiring. We had a rare and precious opportunity to listen to the panelists’ personal stories, which were truly eye-opening for me. 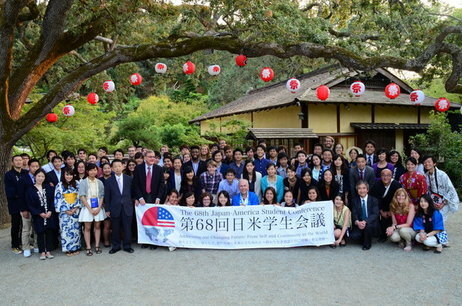 The last event of JASC was the Reception at Hakone Gardens. As a Japanese student studying in the U.S., I instantly felt like I was back home when I entered Hakone Gardens. We experienced traditional Japanese cultural activities such as calligraphy and putting on yukatas. Personally, I found the Nagashi-somen as especially memorable. 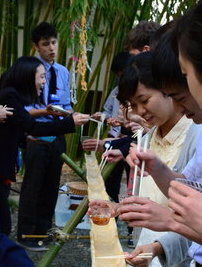 This is a popular summer event in Japan, where somen, a kind of noodle, is sent down a bamboo tube with flowing water. You catch the flowing somen with your chopsticks and eat it. It was my first time setting up the equipment- cutting bamboo and tying them together with ropes- and I felt the genuine Japanese culture there. Looking back, JASC was definitely an amazing experience and I am so glad that I was able to participate in it. Not only did I learn more about the U.S.-Japan relationship through the programs and hours of discussions with peers, but I made long-lasting friendships with students from both Japan and the U.S. I sincerely believe the open atmosphere of JASC, where you can share your honest feelings and opinions, allowed us to make such connections. From the beginning till the end of the program, I felt as if I had known my peers before the actual conference, and it was always comfortable being in the JASC community.To be honest, I did not imagine that I could build such relationships within three weeks. However, this was a pleasant surprise. Continuing these strong relationships that I made throughout JASC is one of the fundamental reasons that I ran for the 69th Executive Committee election. The other takeaway from JASC is the importance of self-reflection. As I interacted with amazing peers whom I respect, I also reflected upon myself a lot, from my identity as a Japanese studying in the U.S. to what kind of a person I want to be in the future. It has been three weeks since JASC ended, and I still look back to it as one of the most meaningful summers in my life. Thank you 68th JASC, and I am excited to come back to JASC as the 69th American Executive Committee Chair. In the midst of planning for the next conference, I am hoping that the 69th delegates will have amazing experiences in Japan! Jon Foissotte, Vice Chair of the 69th JASC American Executive Committee, reflects on the life-changing experiences he had in JASC this summer, focusing on his two favorite sites: Washington, D.C. and Montana. Greetings! My name is Jon Foissotte and I attended the 68th JASC as a student delegate on the American side. Since I was a child, I had always held an intense interest in Japan, which grew and deepened as I studied Japanese language and culture throughout my high school and undergraduate years. 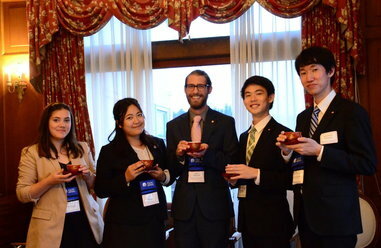 My goal in attending JASC was to be able to more firmly grasp the Japan-U.S. relationship while having the chance to get to know a wide diversity of other students from both countries with similar interests. With this year’s conference now concluded, I can say beyond all doubt that the rare opportunities and enriching experiences afforded to me by JASC surpassed even my highest expectations. 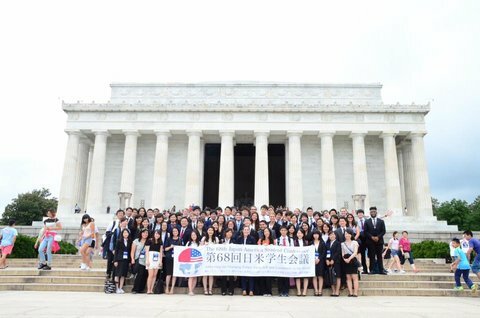 During JASC, I was able to learn a great deal more about the relationship between our two countries from distinguished speakers with unique professional backgrounds, while the same time experiencing ‘Nichibei Kankei’ in its most quintessential form—on a person-to-person level with my fellow delegates. I would like to write briefly about two sites we visited this year that each figured greatly into my overall JASC experience, perhaps because of the significant regional contrast between them—Washington, D.C. and Missoula, Montana. While in the heart of America’s capital, we were privileged to attend panels hosted by individuals in government working directly on East Asian relations. Having the chance to hear from members of the House Foreign Relations Committee as well as from diplomats at the State Department allowed us to understand how these different sections of government each approach contemporary regional issues as well as the roles they play in strengthening the U.S. relationship with countries in the region. While at the State Department, we were honored by a surprise visit from U.S. Ambassador Caroline Kennedy, who took time out of her schedule to speak about Japan-U.S. relations and answer some of our questions. During our visit to the U.S. Chamber of Commerce, we learned about the many opportunities for strengthening regional multilateral relationships from the members of the Economic and Security Panels. This was incredibly fascinating as the speakers included individuals from the U.S. Department of Defense and from the business and think tank communities. Hearing them speak to a number of rising issues and opportunities in the region was both edifying and inspiring. As the Trans-Pacific Partnership (TPP) is a forefront issue of US-Japan economic relations, we were honored to hear from Wendy Cutler who was the senior negotiator for TPP and is currently with Asia Society Policy Institute. Ms. Cutler not only provided greater insight on the agreement and the benefits of TPP, but also encouraged delegates to consider a career in government. To many of my fellow delegates and I who are interested in future careers involved with various sectors of government, being able to engage directly with these experts throughout our time in D.C. was a truly invaluable personal and professional experience that will no doubt form the bedrock of our evolving perspectives. Before we arrived in Montana, many of us were unsure of what to expect—out of all of the sites on our schedule, Montana was the most difficult to visualize conceptually, as almost none of us had traveled there before. Upon arrival, however, we quickly realized one reason this site had been chosen—America’s vast, natural beauty loomed before us in a way that could not be elicited from a photograph. Particularly to someone like myself, who has had rather little exposure to nature, it was precisely because of my prior unfamiliarity that I could appreciate Montana, and why our experiences—which took us through sprawling woods and over rushing rivers, with vast mountainous expanses looming all around us—were so greatly impactive. While in Montana, we were able to reflect on the darker parts of American history as well. We spent time learning about the Fort Missoula Internment Camp, one location where Japanese Americans were incarcerated during the Second World War, while visiting the site’s historical museum. Additionally, we had the opportunity to visit the Flathead Reservation and learn about the culture and history of the Native American tribes living there.We were even privileged enough to introduce ourselves directly to members of the governing council. Finally, we spent our last day in Montana hiking in Glacier National Park, immersing ourselves one last time in the area’s natural beauty. 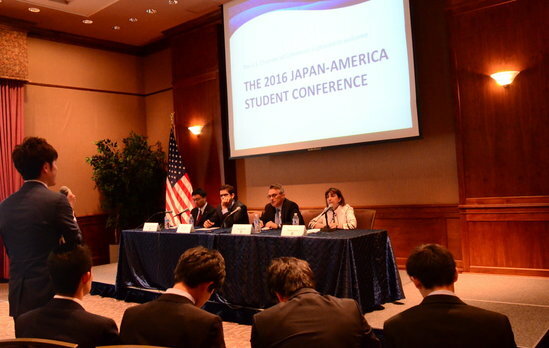 Thanks to these and so many other experiences at JASC, I have been endowed with a much deeper perspective on the unique relationship between Japan and the U.S. as well as its continued pivotal importance in the twenty-first century. Most importantly, I have formed unbreakable bonds with my fellow delegates that will last a lifetime. For these reasons, I will always reflect back on JASC as one of the defining moments of my life. To those who continue to support JASC or have contributed in any way to help make this program what it is today, I would like to extend my sincerest appreciation and profound gratitude. As the American Vice Chair of next year’s conference, I will strive on your behalf and on behalf of the delegates to help make the 69th JASC a defining moment in the lives of others. Please look forward to a second report on the 68th JASC by Yuta Baba, the 69th JASC American Executive Committee Chair, to be posted soon! JASC is pleased to announce the release of the latest JASC Journal! Please view the journal by clicking here. 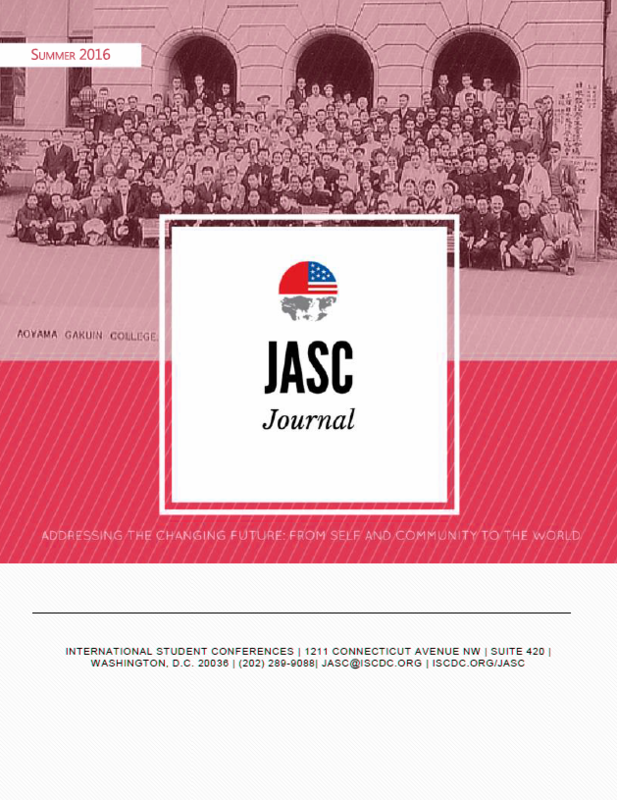 This edition includes updates on the 68th conference to be held this summer, a story by the daughter of 1st JASC Delegate, greetings from new ISC intern, JASCer notes, volunteer opportunities, and more! Please enjoy the Summer 2016 edition of the JASC Journal, and keep in touch! 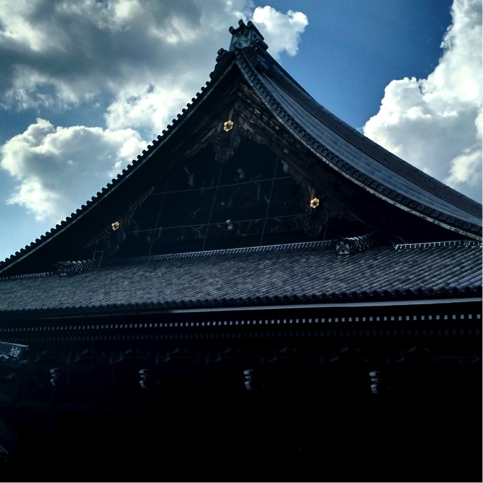 After settling down in Kyoto the JASC delegate set out to explore Japans ancient capital. The JASC delegate split up into three groups, one went to Urasenke to participate in the Chado tea ceremony tradition, another went to the Toraya factory to see and sample some of Japans most famous sweets and the last group went to Nishihonganji, one of Kyoto’s renowned temples. Everyone enjoyed taking a break from meetings and work and finally getting some down time to tour Japan. We then returned to the Kyoto Utano Hostel to have round table reflection. As deadlines approach groups are having to think more critically about the aspects they have learned about each other’s nations and final forum presentations. tool to convince people to migrate and, ideally, live in the area. Made it into the newspaper! 12:15pm: Departure – a particularly bittersweet time. On one hand, I could finally venture outside the building past 10:30pm and explore the wonders that Japan had to offer. However, Shimane’s rural charm is forever etched into my mind. 2:30pm: We reached the first service stop on our long (seven hour) bus ride. This particular stop was situated in Okayama prefecture, curiously known for its delicious milk products. 4:30pm: I slept for the majority of the bus ride, and this service stop included. Honestly, I wasn’t quite sure where we were on the map, but I didn’t mind. I enjoyed the comfort (and air conditioned atmosphere) of the bus ride. 7:00pm: Arrival! Admittedly, I mostly explored the darkness of my eyelids the entire trip. However, when I was conscious, I was in awe at the green rice fields scattered along the highway. When we arrived in Kyoto itself, I was surprised that the weather was not as hot and humid as my round table partner (from Kyoto) warned. The Future: Final forum is approaching rapidly and, admittedly, I am terrified, perhaps at the likely chance of presenting unprepared. Nonetheless, I am determined not to stress about it. Rather, I’m looking towards the future in other ways. For example, I’m excited to further explore Kyoto’s breathtaking beauty – perhaps its famous sites such as Kyoumizudera Shrine. I also want a taste of city life (and a preview of Tokyo’s eccentricity) in the Gion Shopping District. Finally, I intend to reinforce the valuable friendships I have thus far with my fellow delegates. leg of our program to a close with a forum on regional revitalization and following reception. The day started off as any other at our Sunlake residence: at 6AM; a classical musical track wafted through the hallways and bedrooms as our cue to wake. A light cafeteria breakfast came soon after – and by mid-morning, most of us were fully awake and ready to tackle the day. For a volunteer task force of 14 (One Japanese and one American delegate from each RT group), this morning was spent prepping for a presentation to the residents of Shimane later that afternoon. (centralize and define a powerful brand image, increase accessibility to the region and its information, and follow up with locally-based resources while keeping a global perspective). As a digital marketer, I personally wanted to stress the importance of a unified marketing strategy – and expressed this by comparing the differences and issues with Shimane’s Japanese, Korean, and English tourism websites. I’ll be the first to admit that my nerdy obsession with digital marketing made me want to go on and on about this particular fix, but our presentation made sure to equally represent other ideas (such as development of a winter activities program to encourage tourism in more stagnant months). in the medical and IT fields. 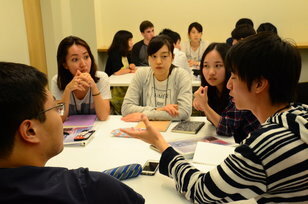 By expressing and developing the talent and focus of the region, both groups sought to emphasize Shimane as a place for businesses to thrive and for eager students to begin specializing. 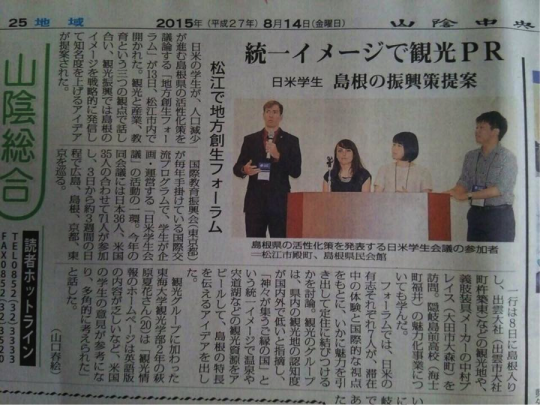 The Industry group also mentioned the possibility of exporting Shimane products in the developing markets of Southeast Asia, and the Education group thought to utilize the large number of empty dormitories in Shimane to help create or convert new charter and boarding schools in the region. Each group’s presentation was followed by special commentary from Shimane leaders in each respective sector, and question/answer sections also brought out more interesting points from the minds of all the delegates. beautiful English Garden in Matsue, where (thanks to the generosity of Shimane industry leaders and members of the community) delegates, special guests, and host families broke bread together over a beautiful spread of food and drink. Shimane gave two brief performances: one of samurai culture and another by the costumed prefectural mascot, Shimanekko (Shimanekko is a yellow cat, dressed with icons from Shimane’s famous historical Izumo Taisha shrine). to our newfound friends, program supporters, and respected community leaders (as tomorrow we were to move to our third location, Kyoto)! The memories of Shimane, however, will forever stay in our hearts. 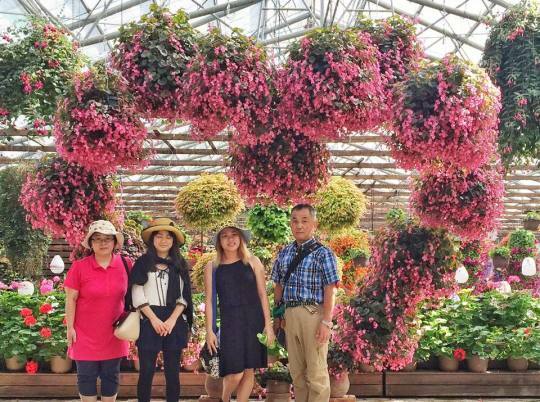 The smiles of our homestay families and the shared countryside experience were an excellent part of our JASC programming, and we gained a perspective many of us would never have seen otherwise. Dan-dan (thank you), Shimane! Until we meet again. My first experience in Japan was in Ishikawa, Komatsu – a small town tucked in the western side of the main island of Honshu. Away from the hustle and bustle of Tokyo, I fell in love with the true Japan. A week in Shimane reminded me of the first few feelings that I felt landing at Komatsu airport. Such feelings were excitement, joy, a fear of the unknown and the feeling of being stuck in Inaka Japan. To a country boy that was raised outside of Port-au-Prince, Haiti and turned city boy due to living in New York and Boston, Komatsu came in with mixed feelings and so did Shimane. 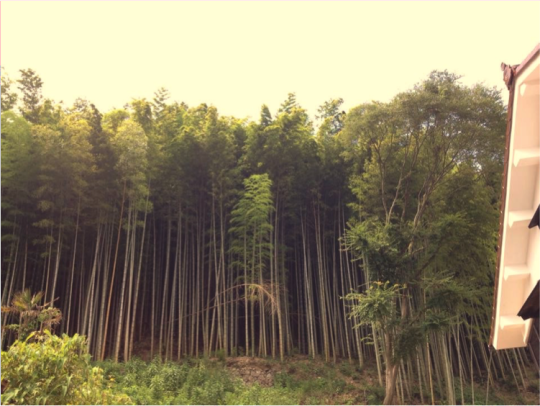 However, surrounded by nature and open fields, Shimane brought upon me time to reflect. Moments of serendipity that are rare when boggled down by a crazy schedule and fast-paced cities like Boston, New York and Tokyo. Since the summer of the year 2011 to now the summer of the year 2015, in the timespan of these 5 summers, I’ve traveled to Japan more than 10 times, completed multiple internships, studied abroad, worked as a consultant at multiple companies culminating to me being now a member of 67th JASC. I could not think of any other way to end my college career and mark the beginning of my life as a Shakaijin in Japan. Nonetheless, the never ending sea of rice fields and rows of mountains forced me to ponder upon the original reason why I decided to learn Japanese. The reason actually stems from my time living in Haiti. The Haitian market is dominated by Japanese goods. From Toyota, Nissan, Honda, Isuzu and more, Japanese cars made made up an overwhelming amount of the vehicles on the street. The television predominantly showed Japanese shows such as Pokemon, Dragon Ball Z and such all translated into French or English. Onigiri were redrawn to be burgers, names were changed and made to have an American or French flair to mask the Japanese influence. Once I realized the Japanese influence that was hidden in the shadows, I was astonished to see how a country so far has such an influence on a small country like Haiti. This officially launched me on a quest to learn more about Japan and how it became a leading soft power player in the world. Never did it occurred to me that I would be coming to Shimane, the land of the gods and cradle of many of Japan’s cultural influences. In the silent and moon-bathed nights of Shimane, I was able to remember and likewise reflect on the original mission that I had in mind when I decided to learn more about Japan. because usually the sun light was too strong. But, the sceneries in Shimane are always beautiful. we are all amazed by Mr. Nakamura’s story for founding his company. I am deeply inspired by Mr.
other people told us our dreams are impossible. it will help a lot of people who lost their hand. atmosphere from the ancient period. Even the vending machine needs to merge into its style. as you can tell from the following photos. After we finished our lovely lunch in Omori city. scientists and researchers to live in this peaceful place. It could be better for them concentrating on their projects, and at the same promote the education in the area. 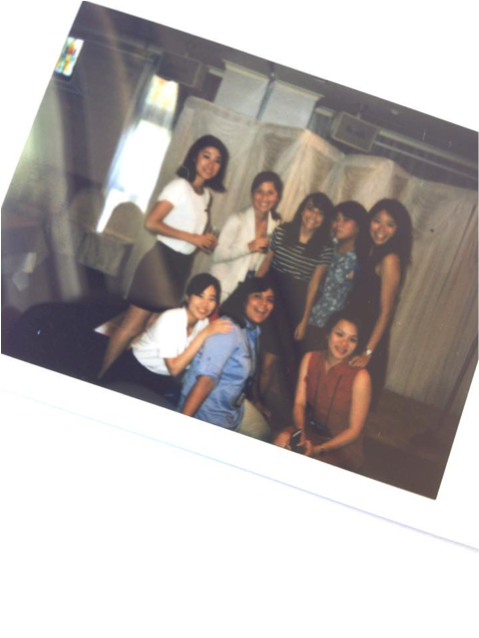 Finally, our day ended with celebrating Ayaka-san’s birthday. Yeah! were two gods named Izanami, a female deity, and Izanagi, her male counterpart. able to learn about this all in person. 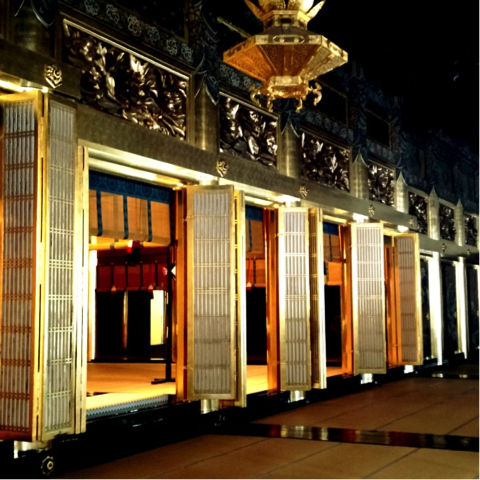 famous shrine, Izumo Taisha has a long history and many interesting features. ritual or a way of blessing us. Okuninishi-no-kami. This is a very special process that deviates from the norm. bowed twice, clapped our hands four times, prayed, and then bowed once more. We then returned to our lodgings and began the American culture presentation. of JASC talent has been revealed. mind, I’m heading to bed. Over and out! 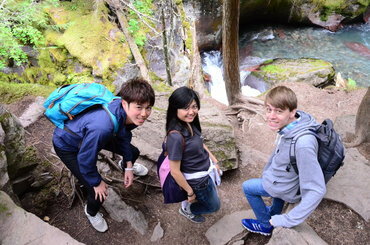 To be honest, I was very nervous to participate in home stay. With my incredibly limited knowledge of Japanese and worrying about violating proper etiquette in a Japanese home, I was worried I wouldn’t be able to communicate or would come off as a rude American  Luckily my 岡さん and かちょさん were very patient and understanding of the minor difficulties I had the first few hours of meeting me. I’m also super fortunate to have ミドリさん as a roommate/translator! Supposedly we’re all going to 温泉 tonight. I’m anxious again – but if JASC or my homestay experience has taught me anything, it’s that my anxieties are usually far worse than reality.